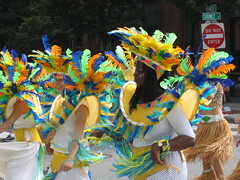 In case you're not going to the Caribbean Carnival, these are a couple photos from previous years. Do you think a hurricane warning is going to stop Caribbean people from having a party? From what I can tell, the parade route I mapped last year is still pretty close. You can still head to Franklin Park Zoo to see the end and grab some island/Latin food from a variety of vendors. There is all of Sunday to batten down the hatches. 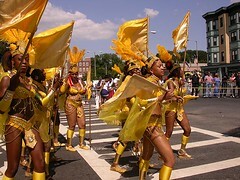 Today can be spent with the thousands at a Trinidad-style carnival like it's been done for almost 40 years. This annual event is usually a good chance to hang out and watch some kung fu movies while chowing down on some al-fresco takeout food in Chinatown. The films are screened with the original Chinese audio (and English subtitles) which is superior than dubbing in most cases. 8pm -- "The Young Master"
8pm -- "The Kid" & "A Moment in Time"
As of Saturday morning, the website has no cancellation information, but there is a good chance rain will spoil the party tonight and tomorrow. One never knows for sure... Except that a hurricane is on track to pass through. I think I've started to see a few gigs featuring The 360's. There's not much info about them out there. The Noise had an article that reminds one they were contemporaries of Buffalo Tom, Letters To Cleo, The Dambuilders, et al. Boston Band Crush pointed out that guitarist-singer Audrey Clark and her sister wrote the song "Yard of Blonde Girls" on Jeff Buckley's album "Sketches for My Sweetheart the Drunk". Thanks to this other site, I was able to download their first album "Illuminated" (in Windows Media Audio unfortunately). It's perfect timing to get back out playing since their sound could be described as early-shoegaze with a hard edge. The Grinds include members with other kickass punk bands and turned it into something fresh and hot punchy goodness. Radio Control are a guitar-drum duo that churn out some rocking tunes. There is more awesome punk rock in Allston. I dig the Latin-influenced rock of Los Sugar Kings. Dance the night away before the oncoming natural disaster!